"Eclipses are powerful astro-trading tools. They're the single most significant factor in profitable market timing!" The latest breakthrough publication from Tim Bost and Jim Cummins in the widely-acclaimed ongoing series of monographs on Solar Eclipses sets a new standard for astro-forecasting! Put the information in this book to work in your own trading and you'll start to unlock the secrets of the hidden planetary dynamics that are the true forces driving the movements of the markets. The astro-trading advantage will put you light years ahead of the traders that rely solely on the tools of conventional technical analysis of market trends. And when you open up the incredible power of eclipses in your own trading, you'll discover profitable opportunities that most other traders don't even know exist! THE EFFECTS OF THIS ECLIPSE LAST FOR MONTHS TO COME! 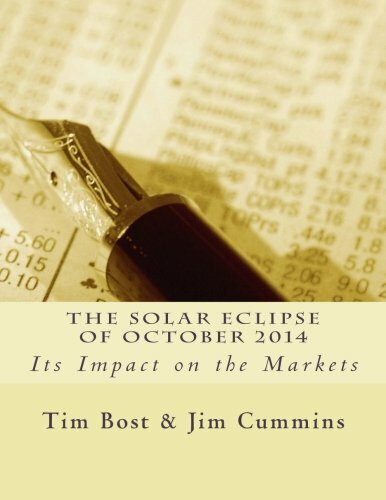 This hard-hitting special research report from Tim Bost and Jim Cummins reveals all the key information you need on the dramatic effects of the solar eclipse of October 23, 2014. Once again, Tim Bost's world-famous wisdom in financial astrology brings you unique insights that you simply won't find anywhere else. With the incredible information you'll find in these pages, you'll be ready to turn tomorrow's market moves into profitable opportunities! The solar eclipse on October 23, 2014 is much more than a one-day event. It sets up a resonant field that has an enduring impact on geopolitics, economic trends, and price movements in stocks, commodities, and the financial markets. Packed with amazing insights and plenty of practical tips, this book will give you the astro-trading advantage now!